There are many ways to write a blog post. I don’t mean content-wise, I mean how you actually type in the entry. Some people write their posts in Word or a text editor, then copy and paste them in your actual blog platform, be it WordPress, Movable Type, Typepad, and so on. Some people log into WordPress and write their posts there. All of these are good ways. Me? 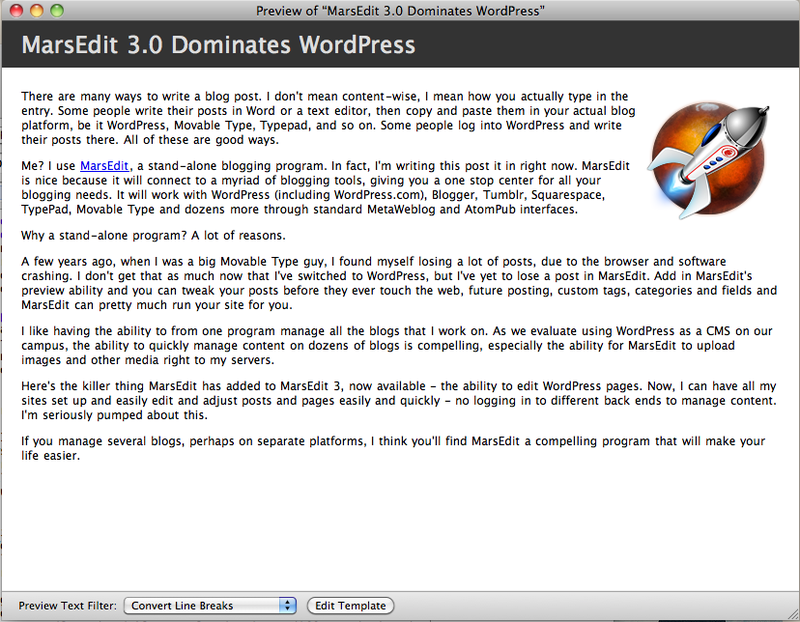 I use MarsEdit, a stand-alone blogging program. In fact, I’m writing this post it in right now. MarsEdit is nice because it will connect to a myriad of blogging tools, giving you a one stop center for all your blogging needs. It will work with WordPress (including WordPress.com), Blogger, Tumblr, Squarespace, TypePad, Movable Type and dozens more through standard MetaWeblog and AtomPub interfaces. Why a stand-alone program? A lot of reasons. A few years ago, when I was a big Movable Type guy, I found myself losing a lot of posts, due to the browser and software crashing. I don’t get that as much now that I’ve switched to WordPress, but I’ve yet to lose a post in MarsEdit. 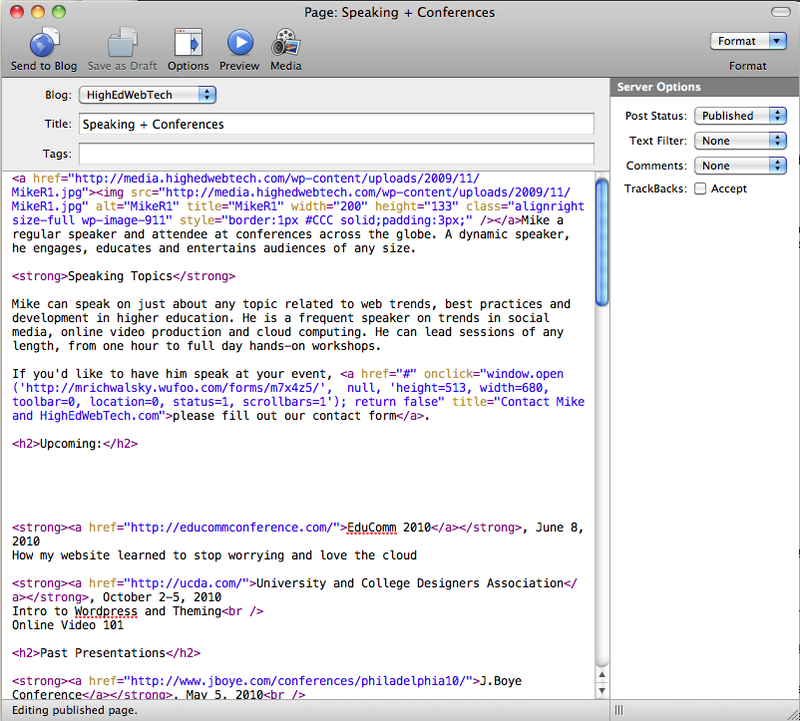 Add in MarsEdit’s preview ability and you can tweak your posts before they ever touch the web, future posting, custom tags, categories and fields and MarsEdit can pretty much run your site for you. 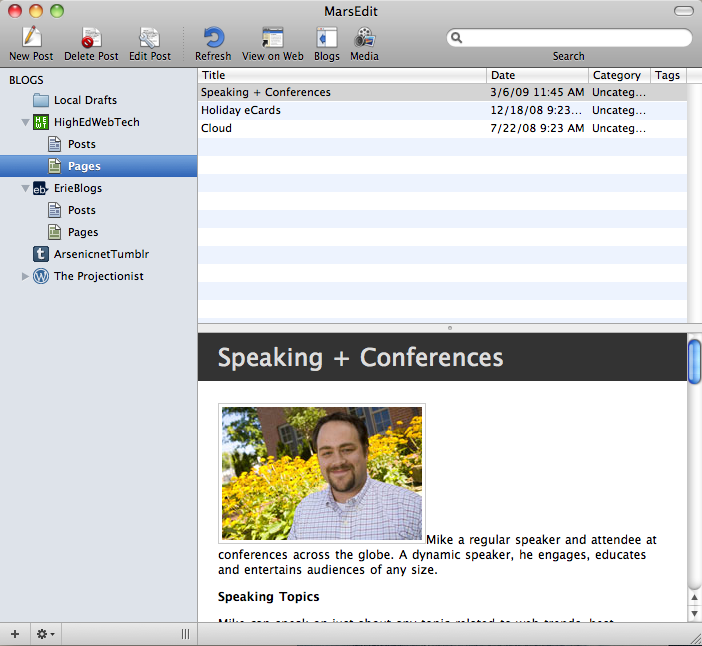 I like having the ability to from one program manage all the blogs that I work on. 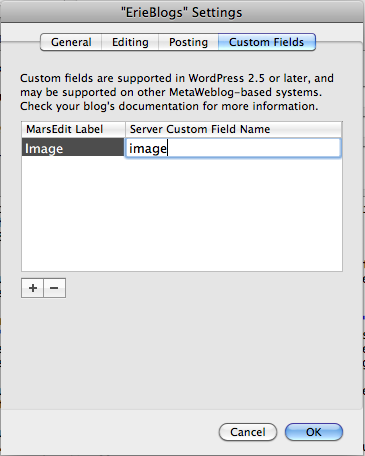 As we evaluate using WordPress as a CMS on our campus, the ability to quickly manage content on dozens of blogs is compelling, especially the ability for MarsEdit to upload images and other media right to my servers. 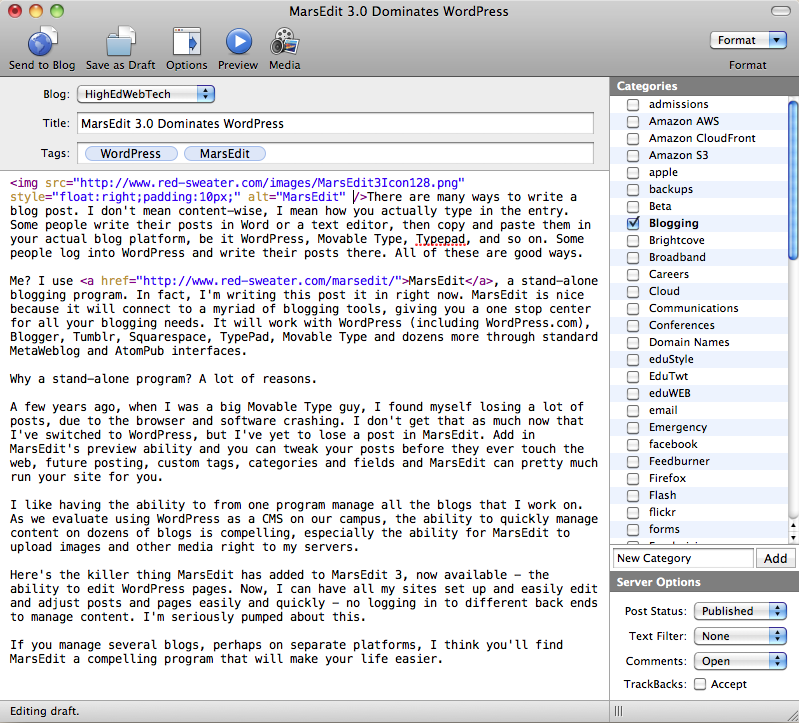 Here’s the killer thing MarsEdit has added to MarsEdit 3, now available – the ability to edit WordPress pages. Now, I can have all my sites set up and easily edit and adjust posts and pages easily and quickly – no logging in to different back ends to manage content. I’m seriously pumped about this. If you manage several blogs, perhaps on separate platforms, I think you’ll find MarsEdit a compelling program that will make your life easier. A 30 day trial is available and the software costs $39.99 USD. Worth every penny.